From enhancing the Bras d’Or Lakes with artificial lobster habitat to developing a management plan for Mi’kmaq traditional use of lobster, and using traditional Mi’kmaq knowledge and scientific approaches in studying eels, Shelley Denny supports UINR in the use of science and two-eyed seeing to address marine and aquatic issues in the Bras d’Or Lakes. Her current work focuses on the integration of western and traditional knowledge systems to take a holistic approach to management of this important ecosystem. Off Nova Scotia’s Atlantic shores lies a hidden treasure – a remote and wild group of coastal islands and headlands encompassing 7,000+ acres of diverse and ecologically rich coastal habitats. The islands support an interconnected mosaic of every coastal habitat found in Nova Scotia, and their boreal rainforests, wetlands, bogs and barrens have gone largely undisturbed by humans for 10,000+ years, providing refuge for a rich diversity of wildlife. 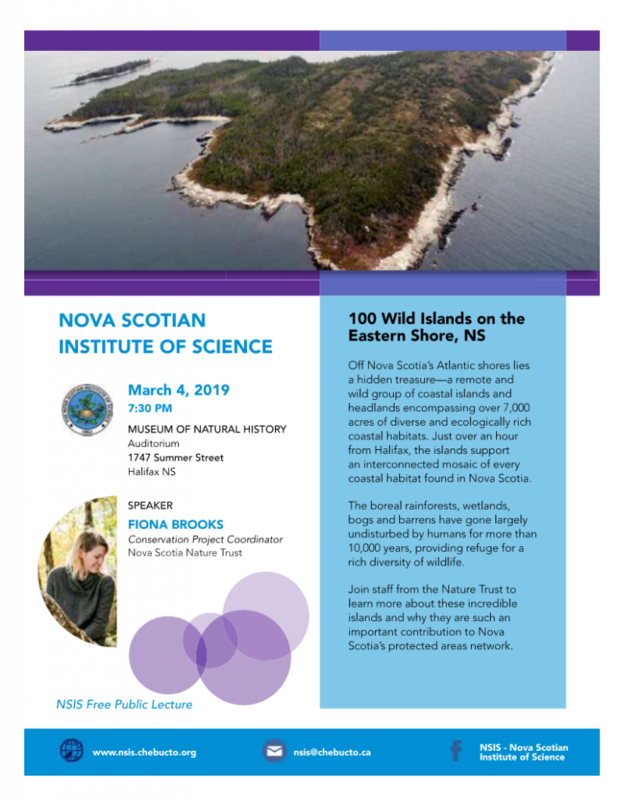 Join Nature Trust to learn about this contribution to Nova Scotia’s protected areas network. 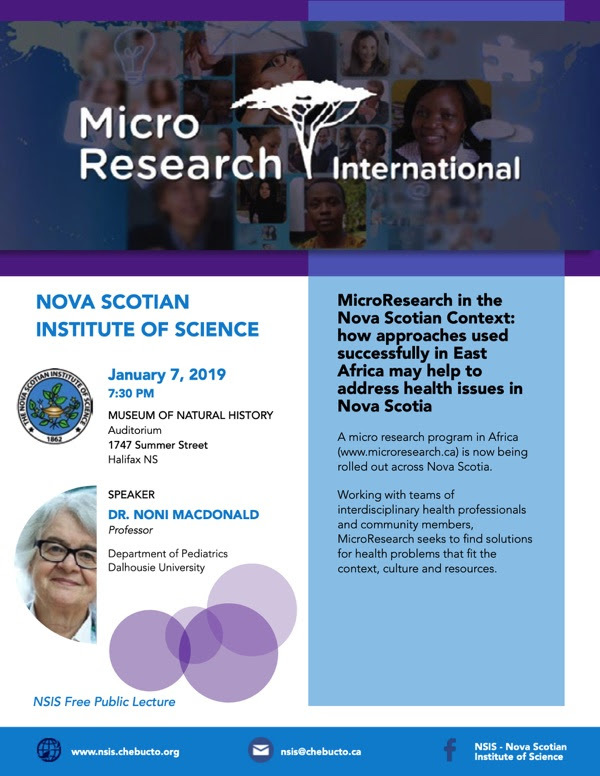 A micro research program in Africa (www.microresearch.ca) is now being rolled out across Nova Scotia, working with teams of interdisciplinary health professionals and community members to fnd solutions for health problems that ft the context, culture and resources. Scientists are frequently called upon to impart knowledge within their expertise. This knowledge is increasingly communicated as advice or advocacy. Ideally, advice is impartial and independent from vested interests. Advice reflects peer-reviewed scientific consensus and uncertainty, contributing to objective evaluations of policy or decision-making options. Advocacy reflects personal values and interests. Advocates selectively frame information with the intent of favouring one policy or decision-making outcome over another. Do decision-makers and society benefit equally from science advice and science-based advocacy? The deadline for the receipt of payment for the dinner is Friday 20th April 2018, as the venue requires adequate notice to prepare for this event. NSIS is pleased to provide you with information on its 2017-2018 Lecture Series that provides details about the organization and this year’s lecture series. A flyer is also available and it summaries the 2017-2018 lecture series. This lecture series is one of the Institute’s primary means of highlighting the great work of scientists across the province. The lectures will be held at the Museum of Natural History on the first Monday of each month and starting in October. Please note that the November lecture will be held on Nov 14th at the Agricultural Campus of Dalhousie University in Truro, and the May 1st lecture will be held at the Great Hall of the University Club on the Dalhousie Halifax Campus. NSIS invites anyone interested in science to become a member of the Institute. The benefits of joining the institute are described on our Membership Page. For further information, please contact us at the Institute’s email address: nsis@chebucto.ns.ca. You can also follow us on our NSIS Facebook page. Reminder to current members: Members are important to the NSIS and dues payments are essential for the Institute’s existence! The Nova Scotian Institute of Science is pleased to be co-hosting the lecture by Dalhousie Professor Jeffrey Hutchings, the 2017 recipient of the A.G. Huntsman Medal for Excellence in Marine Sciences. The NSIS is co-hosting this lecture with the Ocean Frontier Institute.The event will be held on Wednesday, 29 November 2017.at the Scotiabank Auditorium, Marion McCain Arts & Social Sciences Building at Dalhousie University beginning at 7 pm. This is a free event, open to the general public. A reception will follow at approximately 8 pm and light refreshments will be served. Abstract: The collapse of Canadian Atlantic cod in 1992 spawned global research of the factors that affect marine fish recovery. Foremost was the need to stop overfishing. While some fish populations responded positively and quickly to reduced fishing, others did not. We now know that recovery depends on other factors, such as the magnitude of population reduction. The greater the depletion, the more likely a population will pass a ‘tipping-point’, making it more difficult for recovery to occur; small populations are less able to deal with unpredictable environments than large populations. Not all species have the same intrinsic ability to bounce back; the slower a fish’s pace of life, the slower and more uncertain the recovery. And the longer a population remains depleted, the greater the chance that the ecosystem will change in ways that are unfavourable for recovery. Compared to other developed countries, Canada’s recovery initiatives have been remarkably slow to develop and meaningfully implement. Recovering fish and fisheries is fundamental to strengthening the ability of Canada’s ocean ecosystems to adapt to future challenges posed by human activity.